We all have some of those branches in our garden that we want to cut. But for this task, only a best lopper is capable enough to provide effortless cutting. While you have pruning saw or pruning shear for the same task, a lopper makes it extremely effortless, safe and consume least amount of energy. Also, you will not accidently damage the healthy branches of the tree. However, considering the number of loppers available in the market, it becomes perplexing for the buyer to settle on the right equipment. You can also read other product reviews such as pruning shear, pruning saw, pole saw. We are here to help you in finding a good lopper that can satisfy your needs. To start with, we have the best overall lopper from Fiskars which is equipped with amazing features. This one has got a large size which can easily get inside the confined places and give clean cuts. The diameter of the lopper is 2 inches which means that this one can be used on the smaller and sleek branches and stems. The PowerGear technology provide 3 times extra power during every cut. Furthermore, this model has got patented design with modified gears and cam mechanism to conveniently cut the most difficult part of the branch. Made with fully hardened bypass style steel blade, this one can ensure seamless cutting of the live branches and leaves. Also, the blade has low friction coating that give smooth cutting. Other than that, this one is less gumming and resist rusting and corrosion spectacularly. Next is the handle which is rounded and comes with Softgrip touchpoints so that the hand stays at easy throughout you keep the lopper in it. Next in our list is this brilliant anvil loppers from Tabor Tools. The blade here is lethal and causes damage wherever it touches which means that this one is great in cutting those stubborn stems. With a diameter of 2 inches, you can cut small to medium size branches. Because of the long length, you can expect the lopper to get inside where your hand cannot reach and give effortless cutting. The blade is made of hardened carbon steel that is extremely durable and comes with non friction and non stick coating to provide utmost ease of usage. Although the blades are extremely durable but you can also find replacement blades easily available in the market if they get damaged. Now, about the handle, this one has got ergonomic handle with rubberized grip to provide utmost comfort to the hand. Along with the purchase, you will get a book of pruning tips and tricks to enhance your gardening skills. This one is definitely the best anvil lopper in our list. If you want to have the high standards of Fiskars and want to purchase something cost effective then this model is the right solution. This one is the best bypass lopper with relatively small length. The diameter of this model is 1-1/2 inches which is small but work effortlessly in cutting the greens. The lopper can be used to cut the live stem and branches. The material used in making of this model is fully hardened steel and the precision ground blade stays sharp throughout heavy usage. The best thing about the steel is that it is completely rust resistant and have low friction coating that helps the blade to glide through wood and prevent gumming up with debris or sap. The handle is also made of superior quality steel to provide needed durability and strength to the lopper that is needed for extreme usage. In order to safeguard your purchase, this model comes with lifetime warranty. This model from Songmics is the best budget lopper in our list because when you will compare the features with the price, you will be seriously astonished. The brand has done incredibly well on this product. First of all, the diameter of the lopper 1-3/4 inches which make it suitable for smaller branches and twigs. The lopper can quickly chop anything that comes between its jaws. Made with manganese steel, this model is incredibly sharp and durable. Furthermore, the leverage pivot mechanism makes cutting easier while saving your energy and time. About the handle, this one is coated with rubberized material- TRP and PP that make the handle non slippery and feel comfortable in the hand. The long handles help in getting inside the out of reach areas. You can conveniently reach higher branches. Here we come again with the Fiskars model which is extra large and give best reach to the highest branches. Among all the other models in the list, this one is the best garden lopper because of the enlarged reach. The diameter of this model is 1.5 inches which make cutting twigs and smaller branches very easy. The material used of the blade is fully hardened steel with non stick coating that make the cuts really effortless. Also, the steel is of superior quality that do not rust or corrode. The handle of this model is twist lock telescopic handle that can extend from 24.5 inches to 37 inches. The material used in the handle is steel with cushioned grip and there is shock absorbing bumper for comfort. This model is available at highly affordable price and comes with lifetime warranty. Mltools lopper is a great purchase for the people with less arm strength. This one has got extremely long handles and great length for best reach. The diameter is also sufficient for averagely sized twigs and branches. The diameter is great for small trees in your yard. The high carbon steel blade is made with unbeatable ratcheting mechanism to give that extra push that is needed to cut the stems without any additional power applied on the arm. The aluminium handle is a great combination of lightweight and balance. The handle is very sturdy and have non slip grip to give utmost comfort to the holder. This one comes with 100% customer satisfaction guaranteed or money return. This model is the best rachet lopper in our list. This model from Fiskars is a smaller lopper, ideal for people with potting plants in their house or extremely small trees in the yard. Regardless of the size, the diameter of this model is sufficient for thick stems of the trees. However, the length will not allow you to reach far away branches on larger trees. The hardened steel makes this model extremely durable and dependable. Also, you can stay relaxed as it is completely rust and corrosion resistant. The PowerGear patented gear technology multiplies leverage to give up to 3x power on each cut. Also, this one makes cropping, trimming, and cutting very easy. The handle is also made of high quality steel with extremely comfortable grip and superior contraction, making this lopper extremely compatible for arthritis patients. This model is available with lifetime warranty and at an economical price. Well, the next model is from Corona which is a long lopper for the people that have full fledge gardens in their house with large trees and difficult to reach branches. The cutting capacity of this model is 1.5 inches which makes it compatible with thick branches and twigs. Also, this one has got 4 bar compound linkage triples for extended cutting power. Now, about the steel, this model has got high carbon steel with non stick coating to make the blades extremely powerful and completely resistant to corrosion. Also, the blades are Anvil and replaceable and they can be sharpened also whenever required. These are designed and built for professional grade applications. The extra long handles are made of fiberglass and are extremely comfortable. This model is another one of the best loppers available in our list. This 15-inch long bypass lopper from Bond is the last model in our list that is equipped with great features. The diameter of this model 1.5 inches, just like many other models in our list that are compatible with average sized branches and stems. Made with high carbon steel, the blades of this model are extremely sharp and also heat treated to hold the edge for the longest period. About the handle, this model is equipped with high carbon handle that ensure longevity of the loppers. Also, they are extremely comfortable to hold for long time. This model is perfectly sized for people with small hands and also the ones that require lopper for smaller stems and branches. Both Bypass and Anvil lopper are very common among the buyers. The difference is mostly of the blade structure and some other common things. This one is commonly used to cut the greens or fresh vegetation. In these, both the blades move past one another, tearing and cutting away the vegetation. Also, these leave wounds in such a state that they get easily healed. Bypass loppers are more controllable and does not accidently run into the other branches that you don’t wish to tear. The blade retains the edge for longest period and is extremely sharp. Basically, bypass loppers are ideally for the leaves and fresh vegetation. These are not recommended for the dead branches. You cannot apply a lot of force on these loppers as they are not meant for that. Extra force will only make the blade dull sooner and the holding jaws will also leave the lopper. This way, the lopper will set free and break soon. 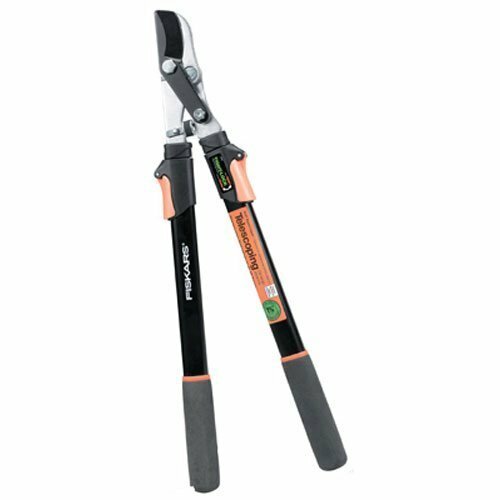 The diameter of these loppers is less and they are great with cutting the live branches. Anvil loppers have very sharp blades that are brutal to anything they cut. That is why, these loppers are ideal for dead branches that require extra sharp blades to come out. These loppers can be harsh with the live stem and branches. That is why they are not recommended to be used on the live stems as these can brutally crush. The blades of these loppers easily get dull because they have to work on the hard and rigid stems. And thus, they will require regular sharpening. Other than the shape, the blade strength and purpose of both the loppers also vary. So, as per the need of your garden, one must pick the right loppers. You should know that loppers are available in different type, sizes, diameter, and price. Before you go on a lopper hunt online, it is better to do some homework and determine your need. High Carbon Steel: The strength of the high carbon steel is simply remarkable and the blades are very durable. These blades don’t break easily because of the hardened steel. But at the same time, these are more prone to rust and corrode. You can keep the blades safe by regularly oiling them and keeping away from moisture and free from residual sap. Stainless Steel: This one is not heat treated and but they have coating on it to keep away from rusting and corrosion for the longest period. Also, because of the coating, the blade becomes extremely slippery and the cut stem and branches simply glides away and do not stick to it. As a downfall, these are not very sharp and loses the edge very quickly. If you try and cut hard branches then it can also break. For either of the blades, maintenance is extremely crucial. So, keep the blades well oiled and away from moisture to get the best out of them. Traditional Loppers: These are basic loppers that work as you close the jaws around the branch. Arm strength is used to cut the branch as these come without any mechanical assistance. Ratchet Loppers: Next are the best ratchet loppers that give some mechanical assistance to the user. Basically, you need to make few pumps and clicks as the pressure develops and cut the thicker branches. These loppers are recommended for the people with limited arm strength. Geared Loppers: These come with the gears below the cutting blades. The loppers have to be opened and put around the branch and the gears will put all the pressure. However, opening the jaws and placing them around the branch has to be manual. These are mostly referred for arthritis patients. Compound Action Loppers: These loppers have special levers and pivot points that provide extra pressure. That is why they are also commonly known as lever action loppers. Long handles usually provide less cutting diameters. However, these are best in reach to the most confining areas such as top of the bushes, etc. It is important to acknowledge your needs before investing in any lopper. For example, if you plan on trimming trees then long handheld lopper will be best suitable. At the same time, if you have small trees in your yard where your arms can easily reach then loppers with small handles can do the task. There are some brands that manufacture telescopic handles in which the length can be set as per the need. Such loppers are less in weight and ideal for the people with less arm strength. Anything that you are suppose to hold over your head or in front of the face must be light in weight. If the lopper is heavy then it will probably tire your arm very soon. At the same time, if the weight is too less then it clearly states the poor quality and making of the product which can break or bend too soon. Most of the brands are offering their products with lifetime warranty. While searching for the right product, always ensure that the purchase is safeguarded with lifetime warranty. Well, as we conclude our lopper review, we would like to say that these tools are extremely helpful in everyday gardening. Each day you find a branch that has to be cut or trimmed. In such case, all you require is a best pruning lopper that can make your life a little easy. From the above mentioned list of loppers, you can make selection assuredly because these tools are top rated and liked by hundreds of buyers. These are cost effective and come with great warranties as well. So, you can make a secure purchase without any doubt in your mind.